it's funny because every time I see a play like this now I think to myself "would've been out with Baez tagging"
Ohhh, August is never right. Runners beats throw, runner safe. If you are like a foot off the bag, okay, you're out. Does anyone else hate it when guys get called out for coming off the bag for a fraction of a second -- something impossible to see in real time? But momentarily lose contact because of physics? Still safe. Rule 162.2 - "If you're a foot off the bag, okay, you're out" haha. Not disparaging you, just, damn it must be hard to write a rulebook, no? Yes, defining this stuff is tough. But this current definition is dumb. Yeah, something like a vertical extension of the base would be my suggestion. If you're over the base, but not touching it, still safe. A big zone and this stuff is unfair. So the reasoning is that they didn't have enough evidence to overturn it. 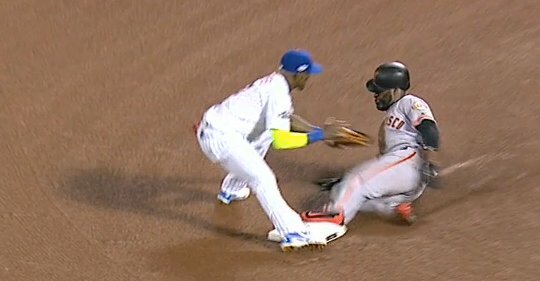 If it was called safe, would they have enough evidence to overturn it? Yeah, default to whatever is on the field call. Laptop battery update: 45%. Don't think I'm going to make it. Well that was a terrible pitch. Maybe the approach is up, not in? It's kind of the Giants thing, after all.